Oh the days when vest tops were ok and the sun set like a golden blaze while I ate noodles. So here it is, the tiny section about me. How I hunted for a flattering photo of myself but in the end all I could find was a flattering photo of nature with myself imposed in the foreground. Welcome to the beautiful sunset over the Andaman Sea from a beach in Thailand. I don’t actually live in Thailand, but I think you will all agree, that’s a pretty lovely sunset all the same. I’m a writer based in Edinburgh where the unfortunate truth is it often looks more like the picture below. I would call it dreich but the great writer Robert Louis Stevenson explains it far better. Auld Reekie can be richt dreich. The ancient and famous metropolis of the North sits overlooking a windy estuary from the slope and summit of three hills. No situation could be more commanding for the head city of a kingdom; none better chosen for noble prospects….. 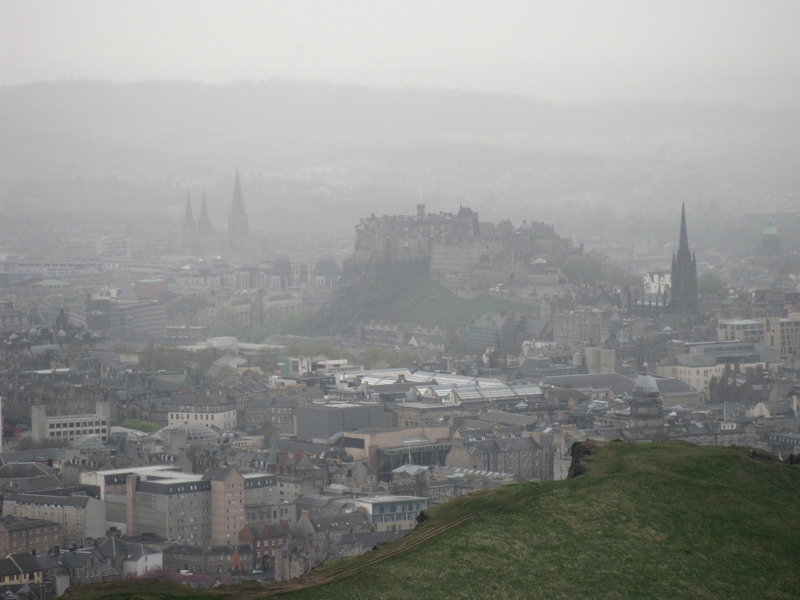 But Edinburgh pays cruelly for her high seat in one of the vilest climates under heaven. She is liable to be beaten upon by all the winds that blow, to be drenched with rain, to be buried in cold sea fogs out of the east, and powdered with the snow as it comes flying southward from the Highland hills. The weather is raw and boisterous in winter, shifty and ungenial in summer, and a downright meteorological purgatory in the spring. The delicate die early, and I, as a survivor, among bleak winds and plumping rain, have been sometimes tempted to envy them their fate. Picturesque Notes by Robert Louis Stevenson, 1903. I am then it seems, a survivor. I have survived these past two years not only the varied maelstroms want to lash down upon the city of my residence with no warning, but more: I have survived with glee and grace a cocktail of medication that would fell an elephant. Now I spend my hours curled protectively around a steaming mug of coffee while hunched over my laptop trying to create the kind of literature that a city like Edinburgh inspires, and has so often been home to in the past. At a time where I have been more limited in the physical aspects of my existence than I would like, each smile punctuated with a cough, I have found inspiration in the writing limited by nothing other than my own imagination, a dark and puzzling beast to be sure. And as those times of wavering energy fall behind, so continues my writing. You can find my work in the imaginatively named “My Work” tab at the top. I’m hoping it will be populated with yet more to come. And most exciting of all, some day soon, when people have stopped telling me what’s wrong with it and grudgingly accepted it’s as good as it might reasonably be, I’m hoping you might find a book of mine too.